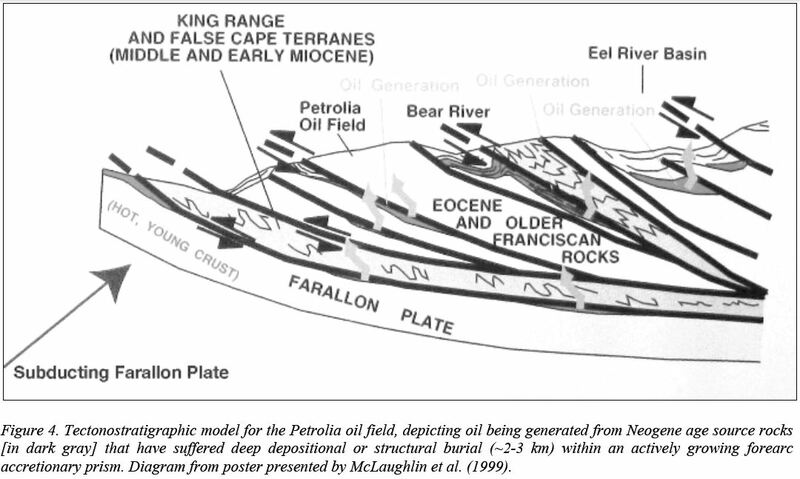 Hello Fellow Fans of Mattole History! It’s time for a little catch-up on the current situation of the MVHS. 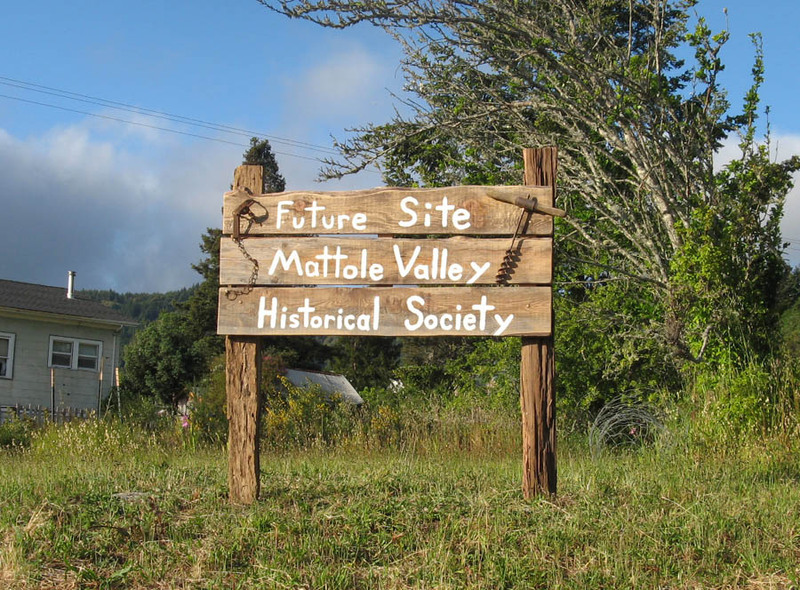 I sent out a General Update to our email list last October (2014); that long message included the idea of a Mattole History Art Festival, which has not gotten off the ground. And this March, I mailed out a 4-page notification of the good fortune of a new building site being offered to us. All MVHS members should have received that mailing—the one with the photo of the old Rock House, the Knights of Pythias building, and a rough sketch of a new building plan. Also, all members were updated in our Spring newsletter, Now… and Then. Since we got news of this offer of land on the Petrolia Square in January, 2015, and particularly since our late March Board meeting where we decided that the option of building there downtown (rather than at the Grange location) was best for our Historical Society as well as for the town of Petrolia and for many of our members (though certainly not all), we have been enjoying a new wave of energy. I have been very happy to find myself working amidst a group of a dozen wonderful, interesting, and dedicated people—our new Board. Many others have come forward, also, to ask how they can help. They are not only wanting to help make the new building a reality, but are offering to conduct interviews with old-timers, help organize the present Grange office, throw in their energy in the future on actually building the structure, etc. It is a very welcome wave of community involvement. The northwest corner of the Petrolia Square, summer of 2015. Our builder, Jeff Hoalton, set this up for us. We have held monthly Board meetings in the open air, right there on the Square in Petrolia, but, for various logistical reasons, are skipping the August meeting. In lieu of the gathering, I am sharing, briefly, the news of our progress. Basically, there are two fronts we are working. One is the building plan. Jeff Hoalton has been given the responsibility of coming up with an initial plan. He is working within the general idea of making a place that fits with a historical Western theme, but is not as expensive as building entirely with natural materials. 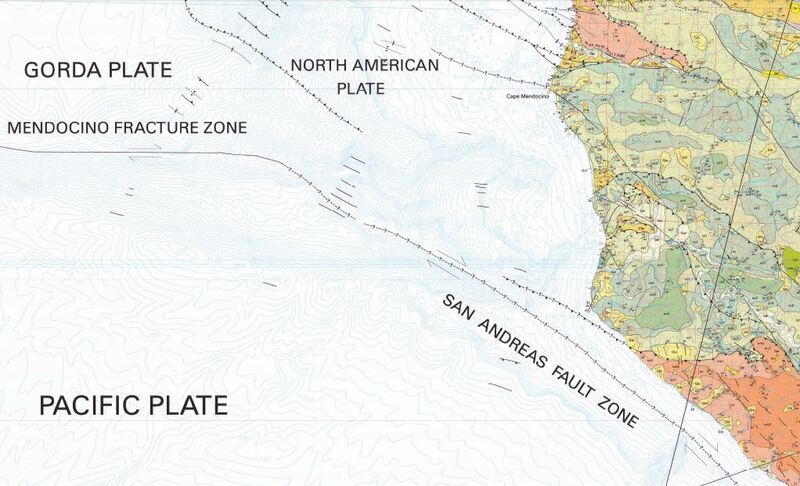 One of the first considerations is that the building be fire-safe, and of course, in our area, it must be relatively earthquake-safe, and able to withstand some mighty winds and rain. Jeff is particularly desirous of working with some of our elder members, to make sure we enjoy the old-timer seal of approval. So we have a sort of “de facto” building committee in that Jeff says he wants to work closely with Board members Becky Enberg, Francis Sweet, Bob Stansberry, and of course our younger-generation builder on the Board, Kelton Chambers. The other important work we’re doing is in the paperwork department. We are reviewing by-laws, articles of incorporation, and our non-profit 501(c)3 status. We have also added new official signers to our Coast Central Credit Union account, and opened a special savings account named the Building Fund. The officers we have named for these official purposes are Dyan Damron, Treasurer; Ken Young, Secretary; Laura Cooskey, Director/President (I really dislike that latter label, and have been assured that in general, my duties will be more along the lines of Historian–focussing on preserving and enlarging our actual store of historical information; for that reason, we have a new position, Connie’s, as follows); Connie Thunman, General Coordinator; and Cindy Lyman, Corresponding Secretary. These five, plus the five listed in the paragraph above, and two more Board members, Ellen Taylor and Bob Stansberry, make up our Board of 12 members. Get a rough plan going, including site issues such as water, septic, utilities, and access. Meantime, establish our legal legitimacy as a non-profit corporation with the sorts of paperwork described above; basically, this means getting our own 501(c)3. Finalize the plans, including the phases needing permits, with Board approval. Make sure the lease agreement is legally tight and approved by the Board. Apply for grants and fundraise in many other ways. The fun part—get to work on the site and the building! 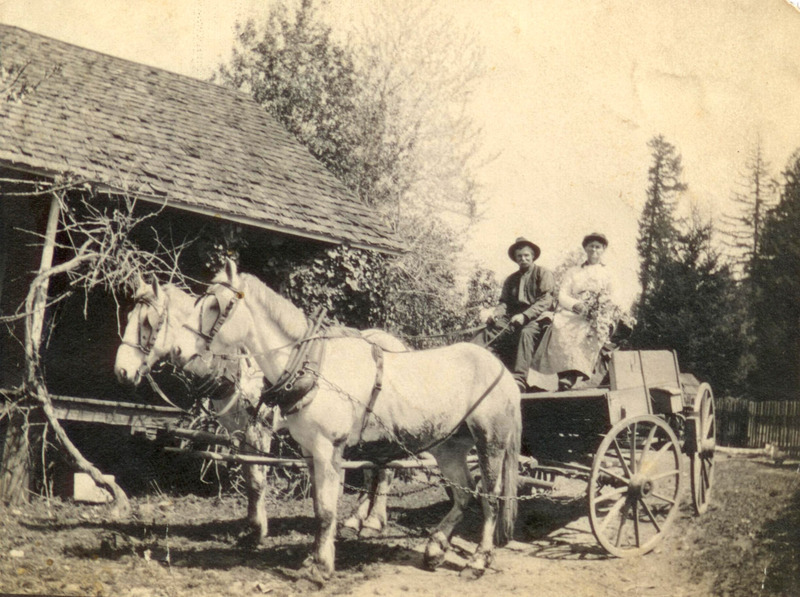 It’s never too early to start gathering funds, however; feel free to mail a contribution to the Building Fund of the Mattole Valley Historical Society, acct. #104881, at the Coast Central Credit Union, 2650 Harrison Ave., Eureka, CA, 95501. I put out my feelers for a weatherproof box to put on the signpost on the Square, and Joyce Benton of Capetown came through. There is now a stack of information sheets about the MVHS, including a plea for donations, in that plastic box hanging below our sign. Members who pay dues should know that unless we are expressly told otherwise, from now on, whenever anyone pays their dues with a particularly generous contribution, anything over $50 will automatically go into the Building Fund. The usual dues amount paid is $20 per membership/subscription; we frequently get a bit extra from particularly grateful or interested members, and if our checking account gets up to where we’re unnecessarily storing cash there, we transfer it to Savings. Now, of course, we’ll transfer it to the Building Fund. Slowly it goes, but it goes. Meantime I seem to have a bit more time for this blog; and my next real focus as Historian will be to set in motion a series of interviews with some of our elders. There are several “old-school” old-timers we need to talk with; and a whole crop of “newcomer” back-to-the-landers who are over 70 and, if we are not premature, well worthy of in-depth interviews. Some people like the idea of video recordings of the sessions—Living History, as they say—and others prefer the old-fashioned notes-and-essay form. We do have one eager young woman who would like to put together a collection of written interviews in the form of a new Mattole history book, and will be meeting with her next week. Please let me know if you’d like to be interviewed, or know any others whom we shouldn’t overlook! Yet there is also the organizing and digitizing of our collection. That is surely the best bet against any threats to our photos and other paper archives. Therefore, I will try to set a regular day a week, at least, to clear up and organize our present Grange office, and to start scanning and saving as quickly as possible. Several people have offered to help with that, but I don’t yet have a system in place. I would like to use a mounted camera over a table, such as Greg Rumney uses for photographs, rather than a traditional copier-scanner—and we don’t have a camera set-up yet. It would save an immense amount of time in scanning such a great amount of material, not to have to save each image separately while re-positioning items upside-down on a small screen. 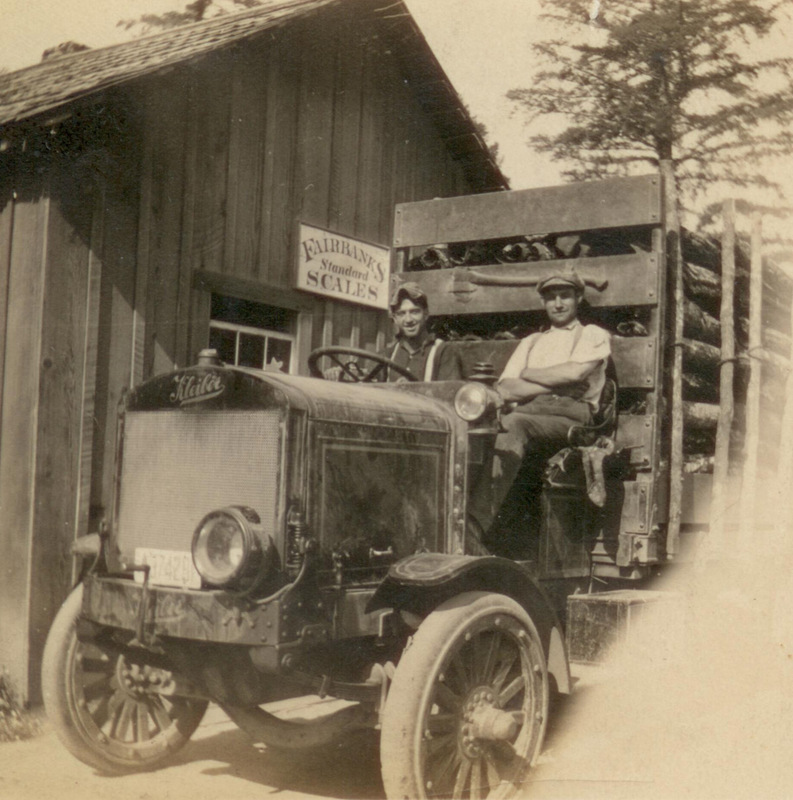 So there is a general idea of what’s up with the Mattole Valley Historical Society lately. Please get in touch if you have any suggestions or would like to get involved—or of course, to sign up for a membership, which includes the twice-yearly newsletter, Now… and Then. Please mark this change, also, somewhere in your files: All previously listed phone numbers will not work! 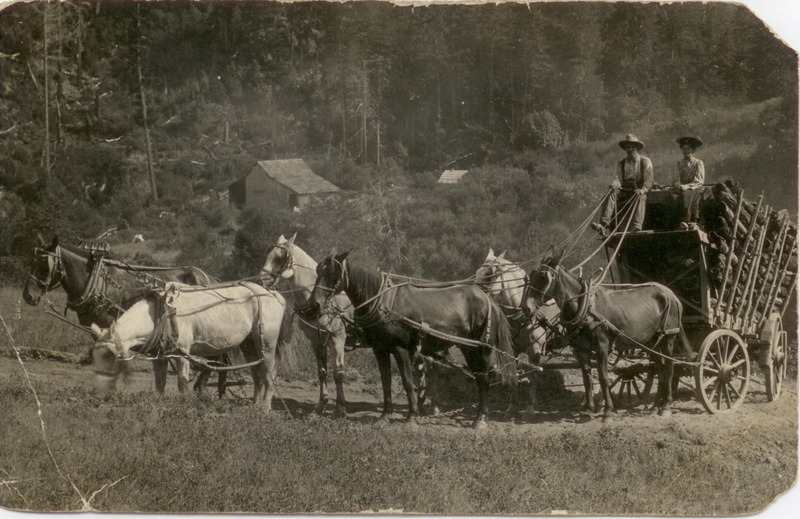 Since I am living in Arcata now, and the office at the Mattole Grange does not have its own phone, the best way to reach the MVHS is by emailing mattolehistory@frontiernet.net; by writing to us at PO Box 144, Petrolia, CA, 95558; or by calling me, Laura, at 707-840-6044, or my cell phone, 707-601-7300. Thank you all for your enthusiasm! Local history buffs have read a respectable amount about the Boots family (there are Boots stories from W.W. Roscoe and Ken and Neb Roscoe; in the Humboldt Historian; and in several other local books, family trees, or scrapbooks). But we didn’t have many photographs until recently meeting Elijah’s great-great-great-great grandson, Phillip Nicklas of Arcata. 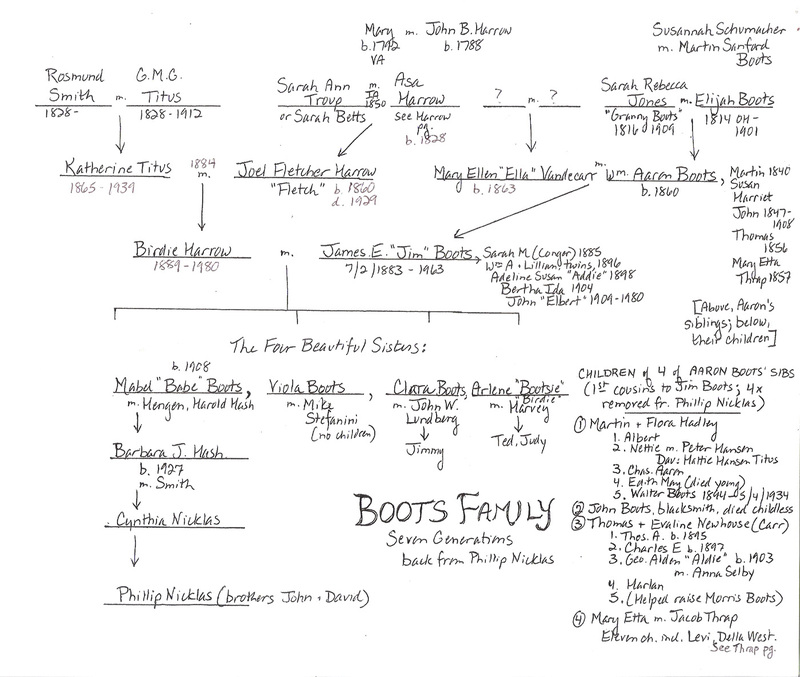 Phillip’s great-great grandfather was Jim Boots, who lived until 1963. And the sisters of his gt-grandmother–four beautiful daughters of Jim Boots and Birdie Harrow–produced distant cousins who passed on many of the old family photos to Phillip, who has a keen love of history. He also has the generosity to have shared with us a disc full of these old pictures, organized by decade. 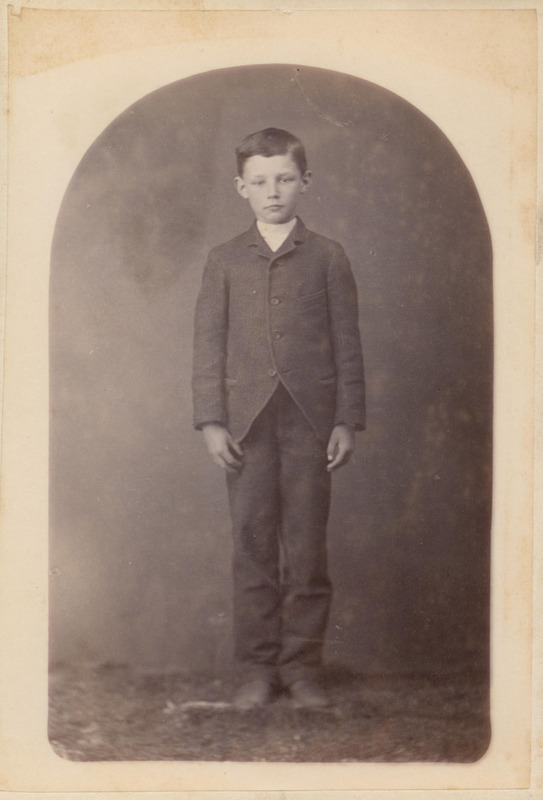 Today we will look at some of the pictures from the 1870s until the 1910s. Please click on this chart to enlarge it. 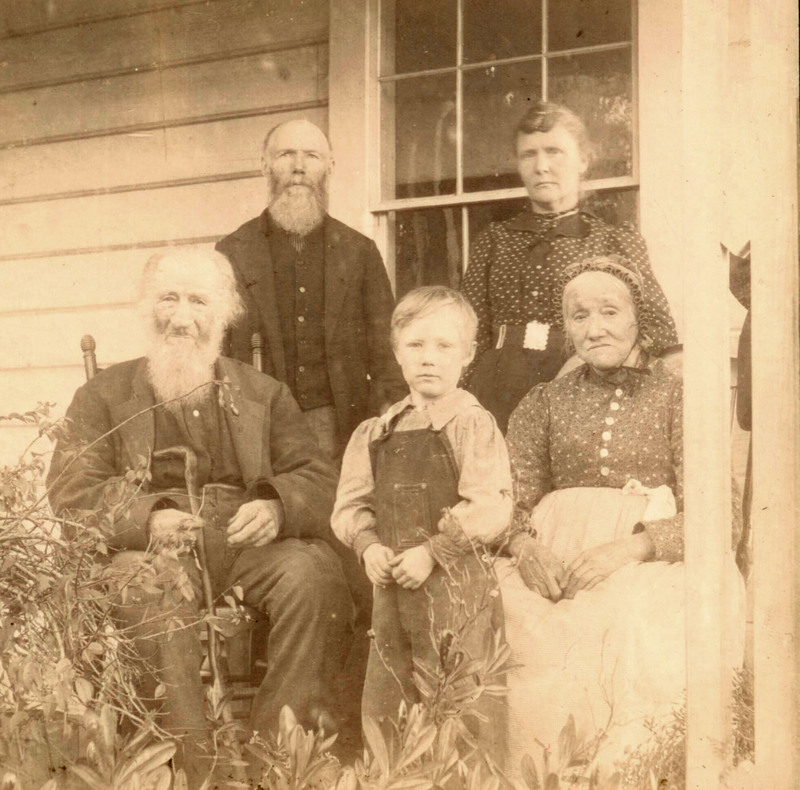 7 generations back: Sarah and Elijah Boots, and Sarah and Asa Harrow. 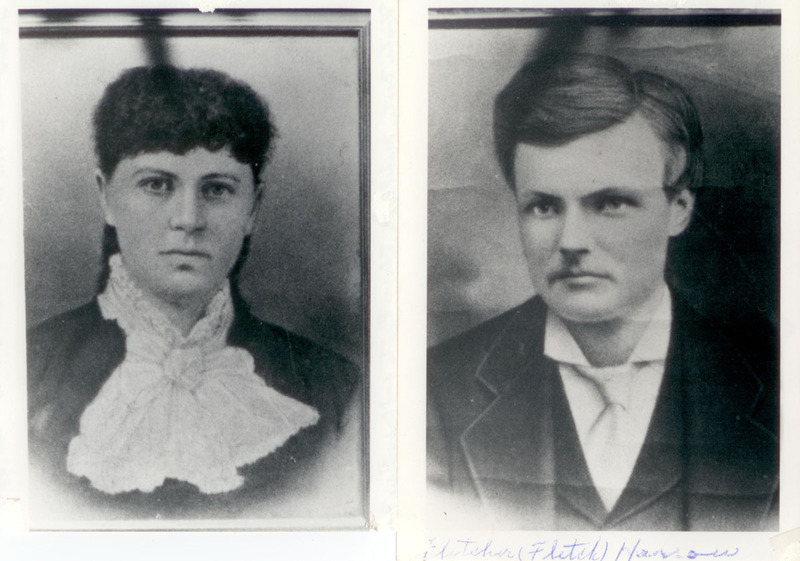 6 generations: Their respective children, Aaron Boots (who married Mary Ellen Vandecarr) and Fletch Harrow (who married Kate Titus). 5 generations: Their respective children, Jim Boots and Birdie Harrow. 4 generations: Mabel “Babe” Boots. 3 generations: Barbara Hash Smith. Granddaddy and Granny Elijah and Sarah Boots, seated, with unknown descendants. 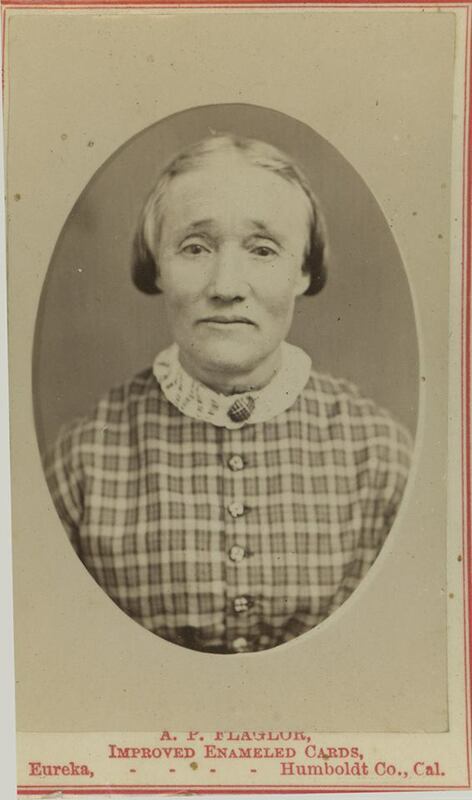 Here is Granny, in typical dress and hairstyle for the 1860s or ’70s. 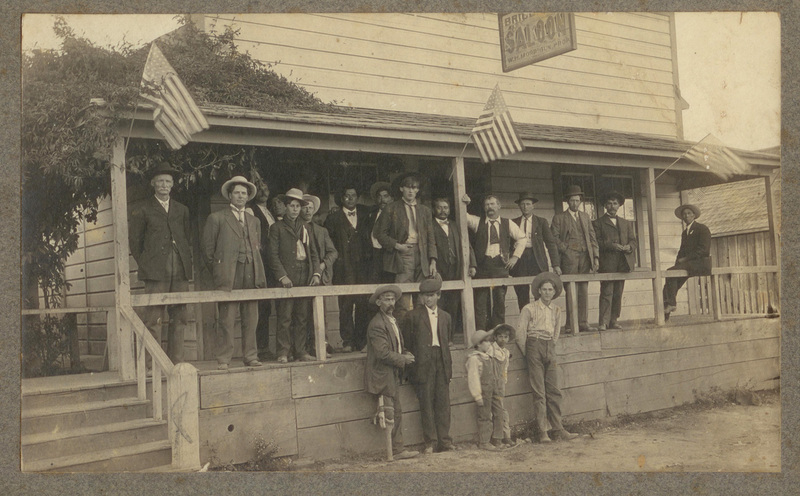 This photo was from our Mary Rackliff Etter collection. Johnny, a son of Granny and Elijah. He was a blacksmith who never married, but lived in the Mattole nearly all his life, until his death of cancer in 1908. Another photo from Mary Rackliff Etter. 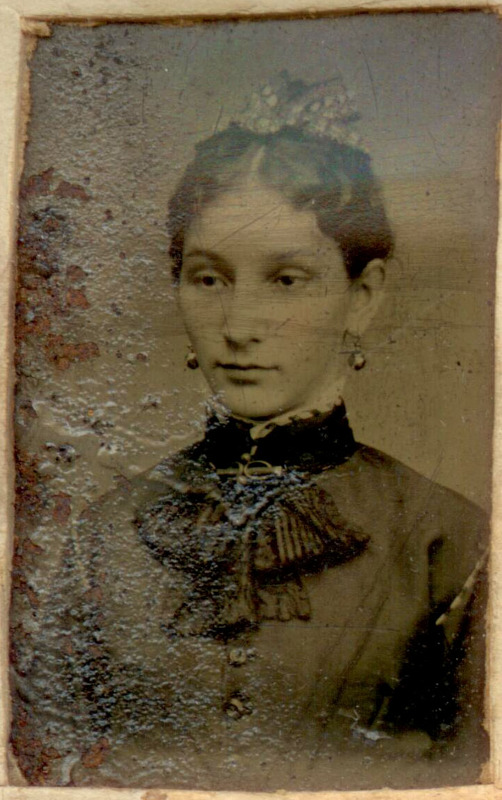 Mary Ellen (Ella) Vandecarr (Mrs. Aaron) Boots, in the late 1870s at the age of 14. William Aaron Boots, known as Aaron, on the left. 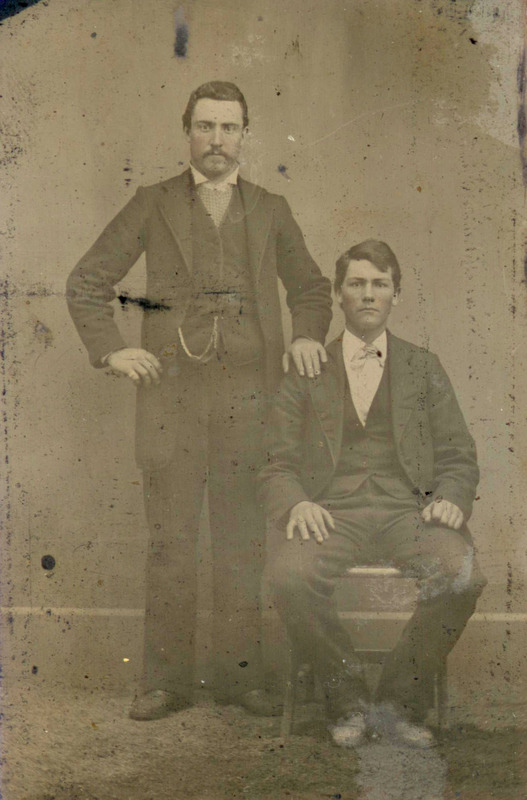 The young man on the right is unidentified, but the paternal hand suggests it is Jim, who was 23 years younger. Perhaps. 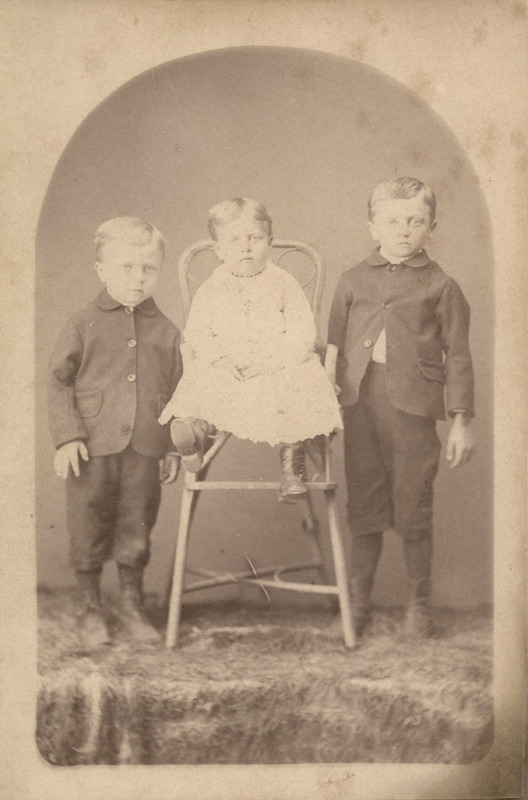 Ivan and Delbert Harrow, with their sister Birdie, future bride of Jim Boots, in the middle. From the early 1890s. 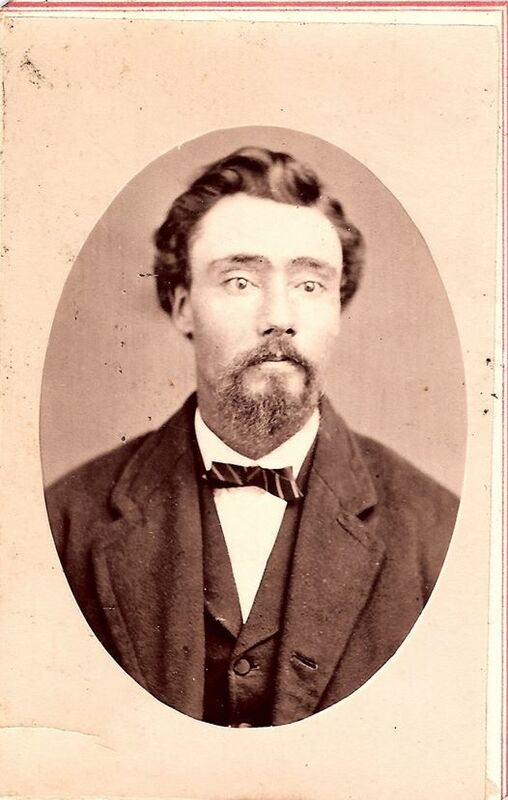 James E. Boots as a youth. Jim Boots and Birdie Harrow, before their marriage in 1907. Hauling tanbark. 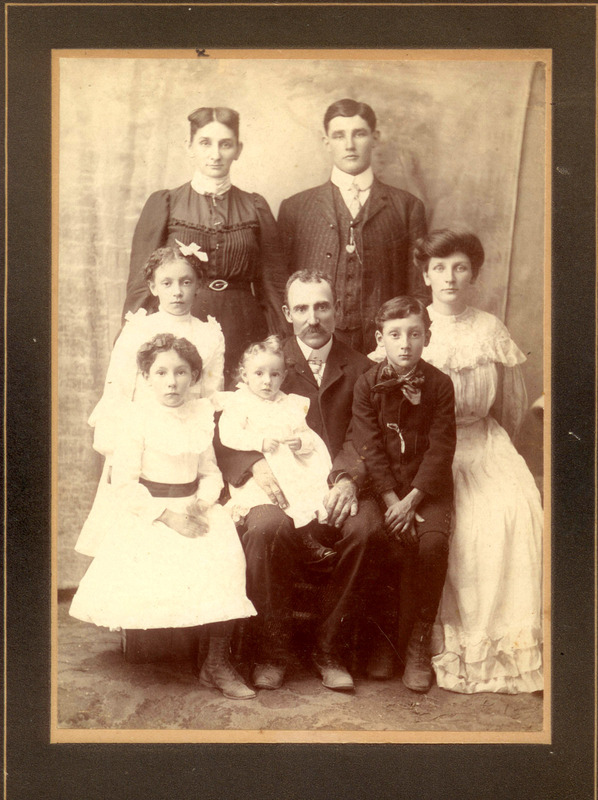 Photo taken in 1908, with Mabel “Babe” Boots as the baby in the center; her grandfather Aaron holds her, and grandmother Ella Vandecarr Boots is in the upper left. Her parents Jim and Birdie are on the right of the picture. 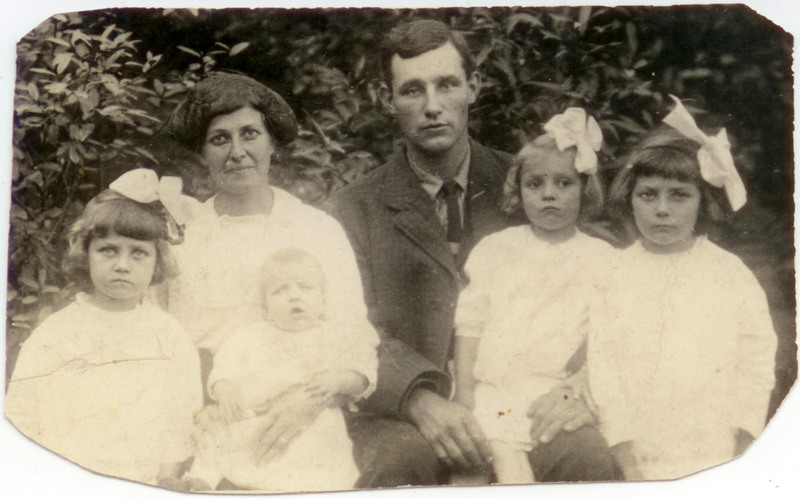 I am not sure of the identities of the other children, those who so resemble Babe and her father and grandmother–possibly her aunt Bertha (born 1904) is one of them, and the others perhaps Addie or Lily and Bill, a few more of Jim’s much younger siblings. Birdie (Adeline) Harrow Boots and daughter Mabel (Babe). 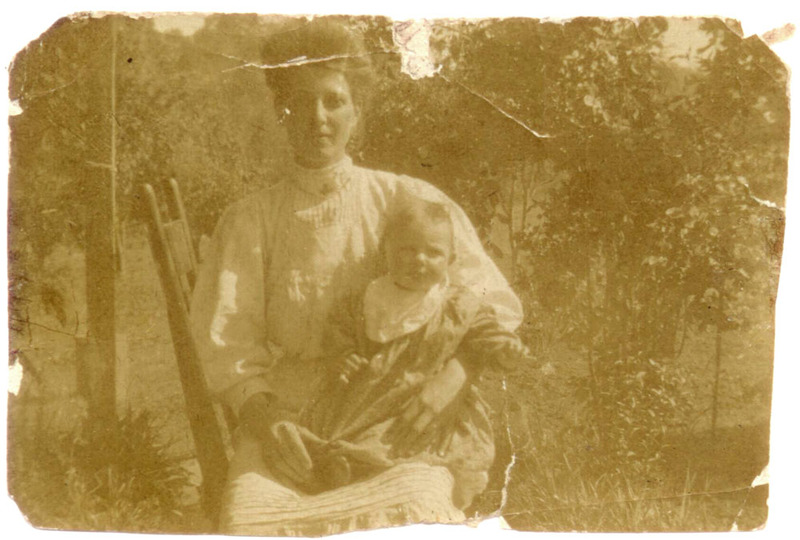 Three generations: Birdie and her little Mabel Boots; Birdie’s mother Katherine Harrow holding Les–her youngest, born 1909, and Mabel’s uncle; and Allie Harrow Carr, Birdie and Les’s sister, with her baby Charlie. 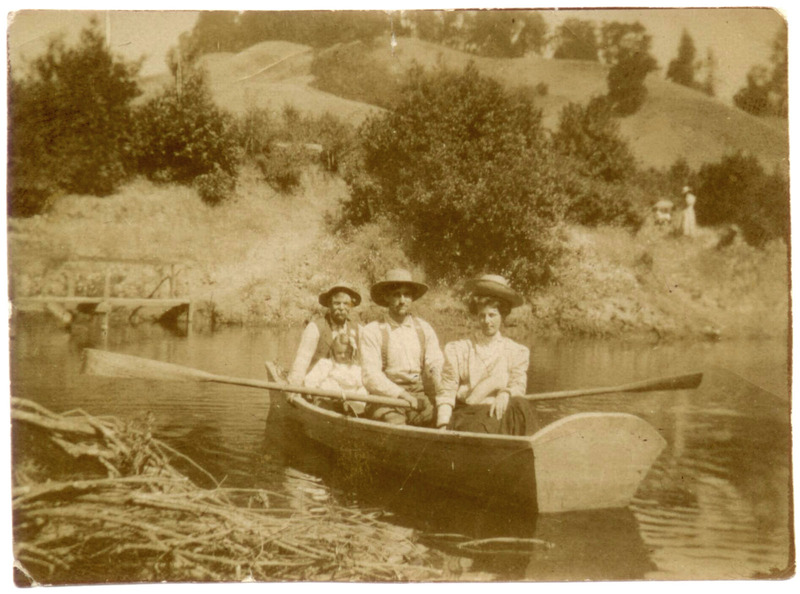 Recreation on the Mattole: Fletch Harrow with his daughter Birdie and Jim Boots, and baby Mabel in front of him. 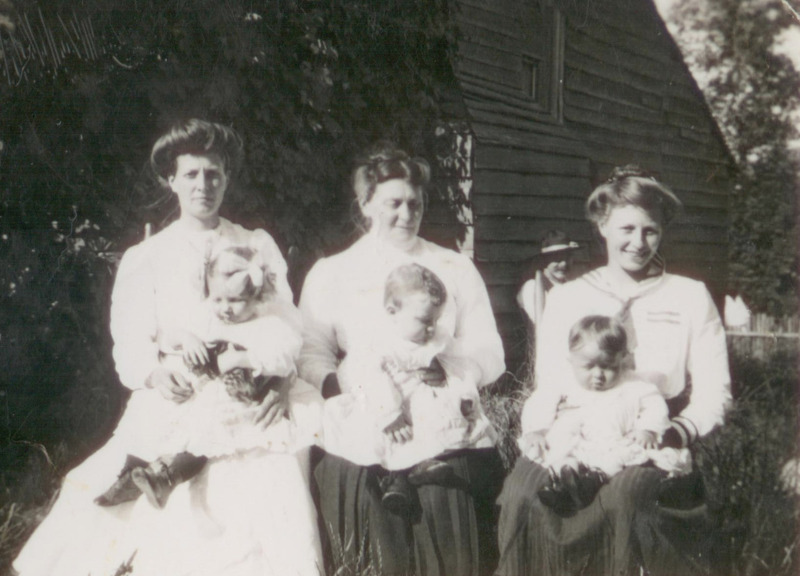 Left to right: Vie or Viola, Birdie Boots, baby Bootsie, sometimes called Birdie, Jim Boots, Clara, and Mabel “Babe”. 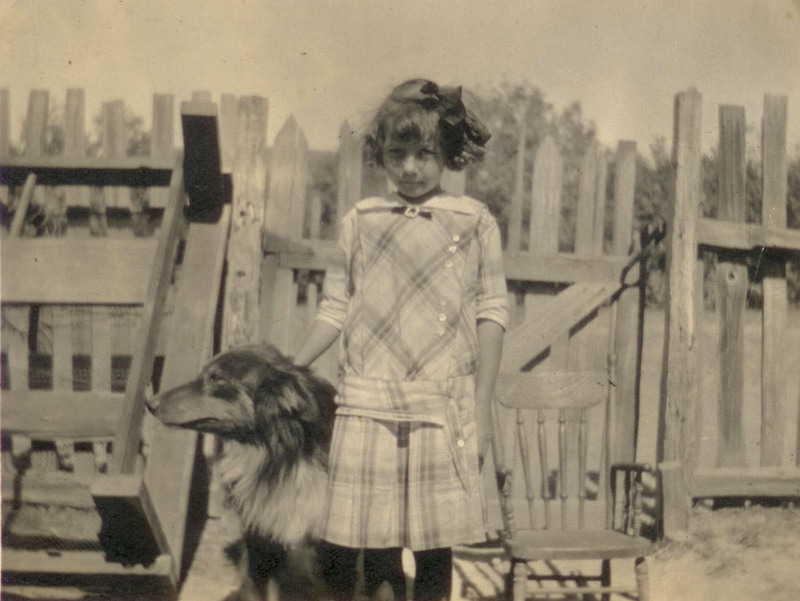 Mabel “Babe” Boots at age 8, with her dog. 1916. 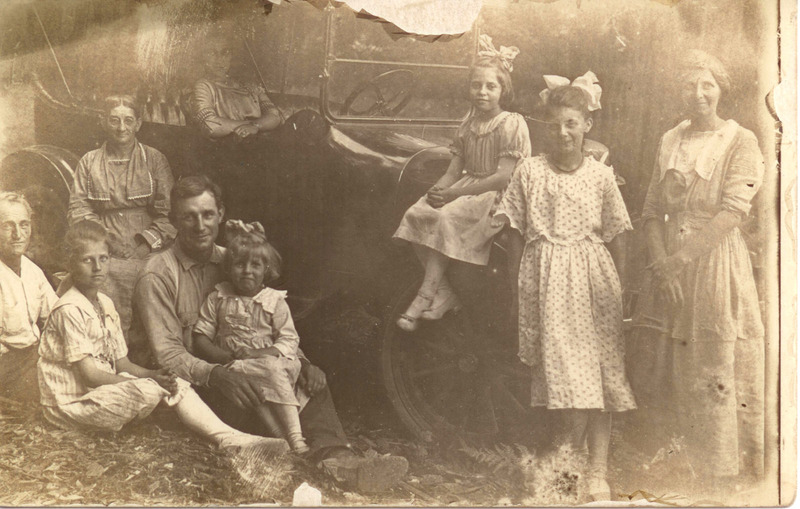 Aunt Lily (Jim’s sister) in a 1917 Dodge, with Aaron and Mary Ellen (Grandma to the girls), Jim Boots next to Vie and holding Bootsie, Clara, Babe, and their mother Birdie. Briceland Saloon. Probably “Bogus” Bill Frazier in the front, with the wooden leg. Click on this one; there’s lots of great detail. Both of these Briceland photos were marked with the studio tag “Hazeltine, Mendocino.” Martin Mason Hazeltine was a photographer who practiced in Mendocino from 1866 or ’67 until at least 1883, then off and on until his death in Oregon in 1903. You can see a photo of his Mendocino studio, which i assume carried on under his name for some time after his 1880s departure, at this link. The old Briceland Store. It looks as if a baseball game line-up is noted on the blackboard behind these people. 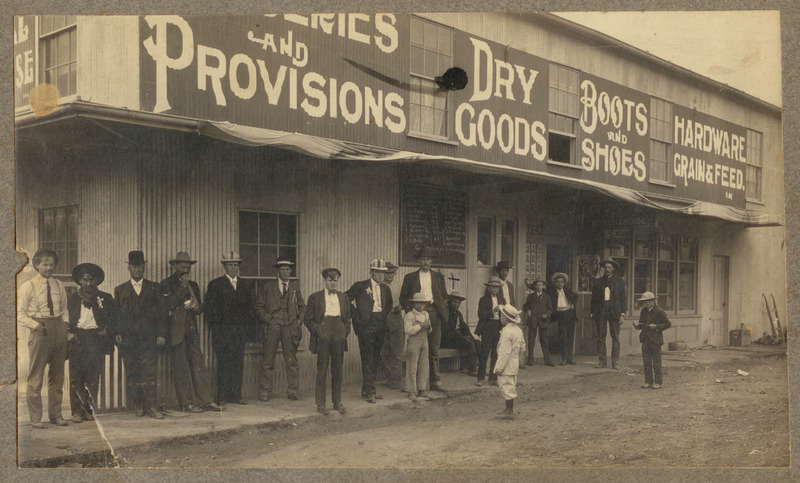 Notice the blue cross next to Jim Boots, and the Native man beneath it. 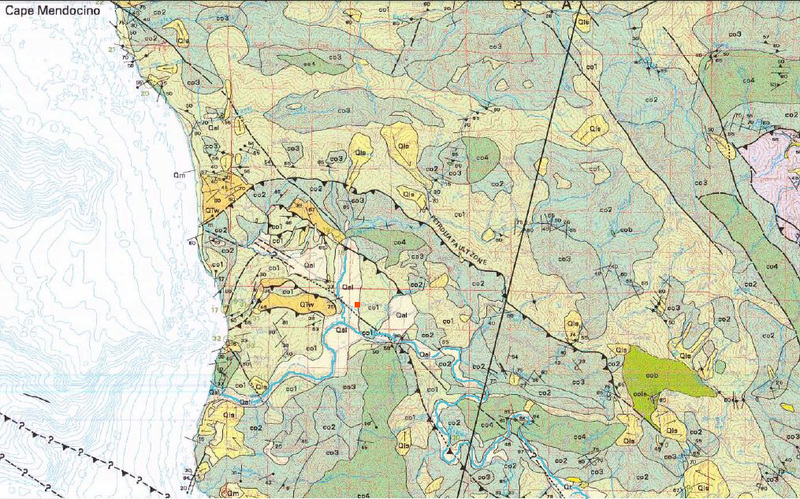 There were many mixed-blood families in Briceland around the turn of the last century. 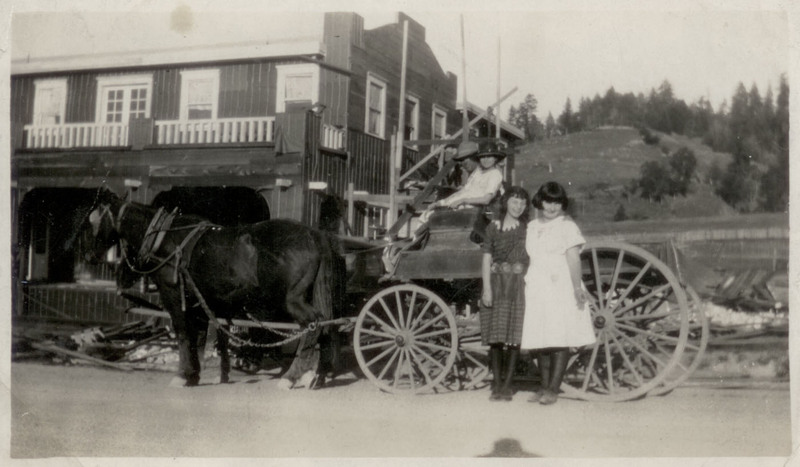 Mabel and friends in front of the Redwood Inn, south end of Garberville. Jim Boots at the wheel of old Wagner Leather Co. truck. They were the Stockton-based leather tanning company who had an extraction plant in Briceland. This is Shelter Cove. Someone fill me in on what’s going on here. 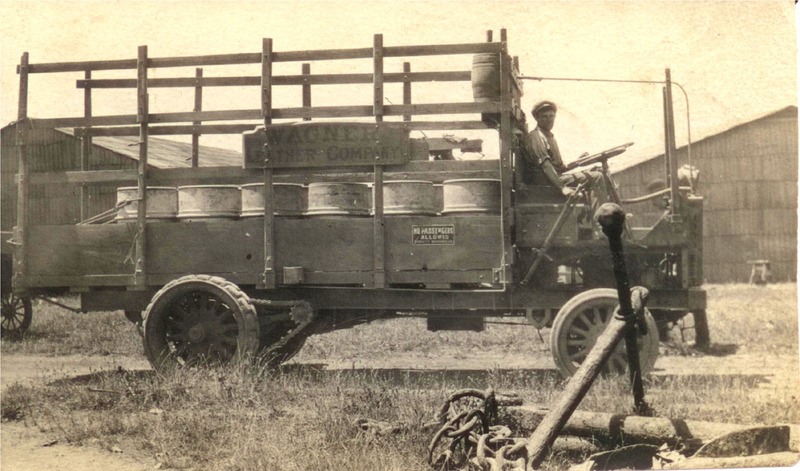 Unloading hay from the loco-mobile, or readying barrels of tanbark extract for shipment? And is “loco-mobile” another way of saying “trailer truck”–a locomotive pulling trailers, on wheels? Before leaving this post, i would like to thank Phillip Nicklas very much for giving us these images. Please do not repost the pictures without asking permission, and giving due credit to Phillip! 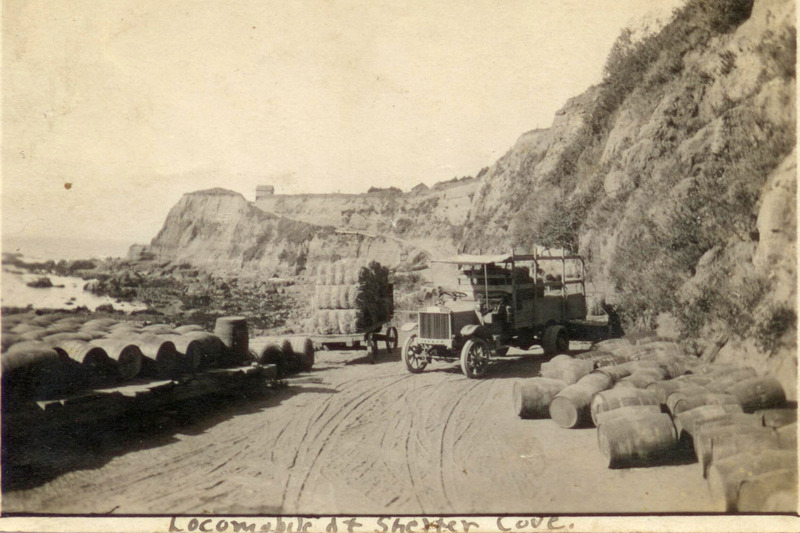 There will be more put up here soon, photographs from around 1920 until the ’40s. I hope you have enjoyed these!